Congratulations Trinity Hansma for her Second Place finish and new PB of 172cm in High Jump at the Legion Nationals. 4 former members of VAAA, now competing for SFU and UBC, at the SFU/UBC DUAL MEET at SFU today, March 25. 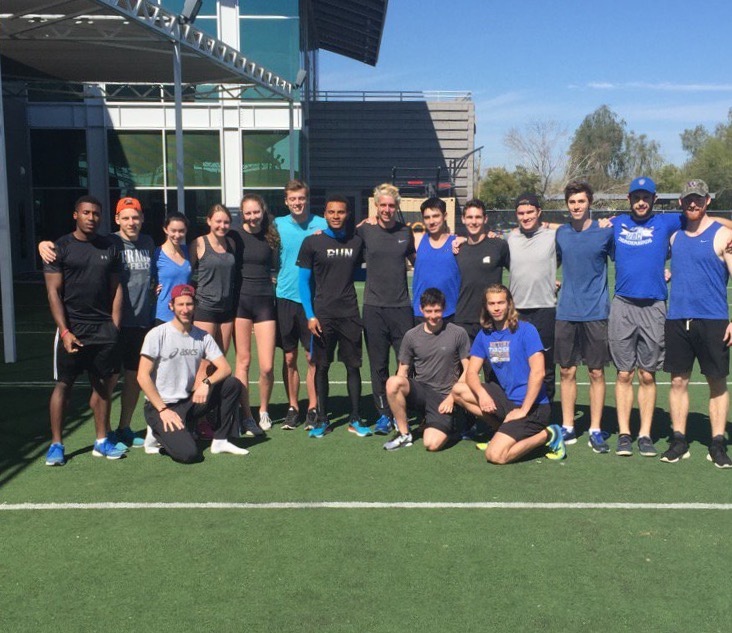 Former VAAA member Chris Loland and some members of the UBC track and field team were training in Pheonix last week. They had the chance to meet Andre DeGrasse, Canadian Olympic Sprinter while there. Chris is third from the right and Andre DeGrasse is in the center, blue sleeves, shirt says run. Brown, seen here in a recent outdoor meet, recently won the GNAC indoor championship in the triple jump event, one of a number of SFU athletes who finished first. Congratulations to Ella Brown on her recent performance in Nampa, Idaho. Story in the morning star or check the BC Athletics site.